Guided questions will be helpful in orienting users to the animation and for drawing relationships between the displayed contents. Best used in context of surrounding lesson [link http://www.explainingclimatechange.ca/Climate%20Change/Lessons/Lesson%20..., unless students are already familiar with concepts addressed. 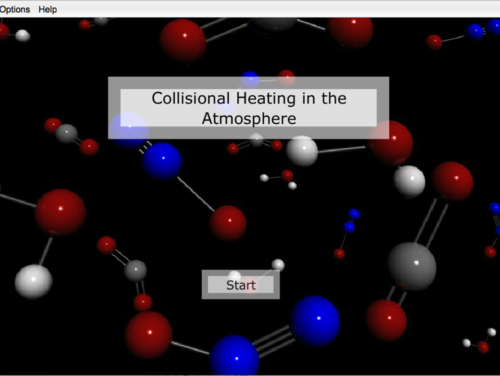 Great animated visualization of collisional heating in the atmosphere on the molecular level. Options to see the individual effects of various molecules in the atmosphere (CO2, H2O, N2O, O2, N). Options to display more or less information as needed including black body radiation, the IR spectrum, other gases in and relative temperature of the atmosphere. Educator might need to provide students with explanation and definitions of concepts involved in the processes that are being animated. Lack of guided questions makes orienting to the animation difficult at first, but there is ample opportunity to create guided questions or to allow for authentic exploration by the learner. Requires basic outside research of concepts if the instructor is unfamiliar with the material. As a stand-alone, may lack sufficient guidance for intended users. Very simple and clean design for online use. Need internet access.